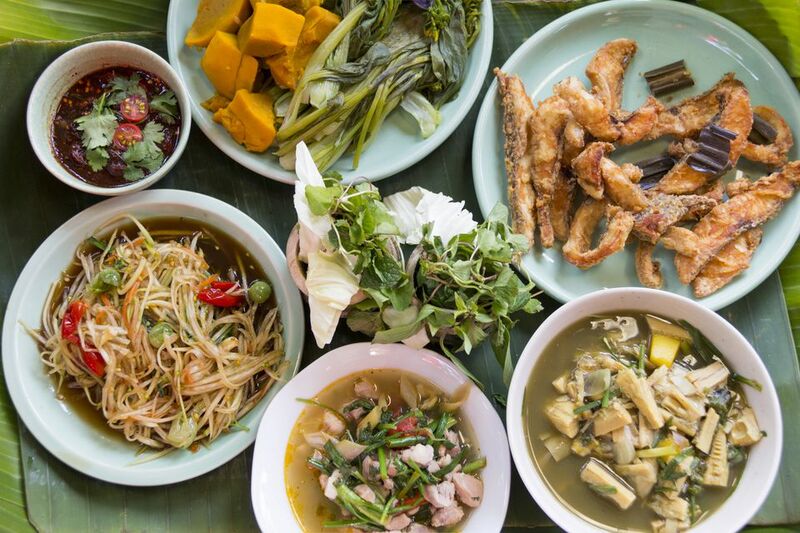 Isan, the northeast region of Thailand, represents about 30% of the country's population but punches well above its weight when it comes to its dominance in Thai cuisine. Although Isan food is less common outside of Thailand, inside the country it can be found everywhere, from street food vendors in Chiang Mai to high-end restaurants in Bangkok. This may have something to do with the fact that millions of people from Isan have left the region looking for work; apparently, they've brought their food with them. It's more than that, though, as the cuisine is almost universally a favorite among non-Isan Thais and visitors, too. What makes Isan food different from what Westerners think of when they think of Thai food? There are a few flavors and ingredients that seem to predominate: chili peppers, lime, peanuts, dried shrimp, fresh fruits and vegetables, sticky rice, cilantro, mint, and other fresh herbs. Though flavor layers are very complex, food preparation is often quite simple, and instead of curries that have simmered for hours, fresh, brightly flavored savory salads form the backbone of Isan cuisine. Simple marinated grilled or fried meats and sticky rice are often accompanied by one of the region's many " tams," or salads. Sticky rice. In Isan rice is prepared as one big, sticky clump as opposed to in the soft, separate grains you're probably used to (and you'll find in most other parts of Thailand and Asia). Sticky rice is served in a small steamer or bag and is best eaten with your fingers as it's pretty much impossible to eat with a fork. Locals will pull off a clump of sticky rice and dip it into the salad or another dish they are eating before popping it into their mouth. Som tam. The most popular Isan dish around is som tam, a spicy papaya salad comprised of shredded green papaya, green beans, tomatoes, peanuts, lime, dried shrimp, garlic, chili peppers, fish sauce, and palm sugar. All the ingredients are pounded together in a mortar and the result is a salty, tangy, slightly sweet and sometimes very spicy, crispy salad. There are many variations on som tam, and you'll often find it made with salted crab out on the street. Other similar salads are made with Thai eggplant, green banana or green mangoes. Larb and Nam Tok. Larb, which is made with ground meat, and nam toke, which is made with sliced grilled meat, are similar in that they share the same sauce: a mixture of lime juice, fish sauce, herbs and spices, and crunchy roasted rice. Larb, which is typically made with ground pork, sometimes also has pieces of pig liver in it, too (some diners find that unappealing so make sure to ask before you order). Although tourists don't often know about larb and nam tok, they become fast favorites once they've been tried! Gai Yang. Grilled chicken. Simple grilled chicken, often made on a small charcoal grill on the side of the road, is a staple of Isan food. You'll also find grilled pork neck and grilled fish, too. The meats are often marinated in a simple sauce with lemon juice, sugar, and other ingredients but the flavors are not usually overpowering. Gai Tod. Fried chicken. Though we tend to associate fried chicken with the American south, for whatever reason Isan folks fry up a mean bird! The crispy coating is sometimes a bit sweet, sometimes flecked with sesame seeds, and always served with super spicy dipping sauce. Though the classic Isan combination is gai yang, som tam, and sticky rice, if you want to indulge a little, have some gai tod instead. Moo Ping. Skewers of marinated meat, usually pork, grilled and served on the stick with dipping sauce, are very popular Isan fare. The marinade is usually a little sweet, salty and full of garlic and the meat is fatty and tender. For 5-10 baht a stick, they make a great road snack or even a meal with a little bag of sticky rice. Though moo ping is often mistakenly referred to as satay, the latter is prepared with a coconut-based marinade and probably originated in Indonesia. Isan Sausage. This pork and rice sausage is very popular as an evening snack and it's often prepared in small balls connected to each other and cooked on a grill. What makes this sausage, called sai crok, isan, special is that the meat and rice mixture is stuffed into casings then fermented for a few days before being cooked and served. It sounds risky but the garlicky, sour flavor is sublime. Isan Alcoholic Drinks. Beer is popular in Isan, and the most popular Thai beer brand is Leo, though you can find Chang and, in some places, Singha, too.